01/06/2013This entry was posted in Canary Islands, Europe and Middle East, Spain and tagged Canary Islands, Gran Canaria on 1st June 2013 by Andy Mossack. All the Canary islands have a unique volcanic landscape. They were born from volcanic eruptions some 20 million years ago (although there have been a few more since) and the lava, now cooled to a blackish rock-like substance called lapilli, has left its footprint everywhere, and even more extraordinarily, has been used to fuel agriculture, vineyards, black beaches and some stunning architecture. 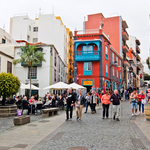 But Gran Canaria has an added advantage over its sister islands because of its location. 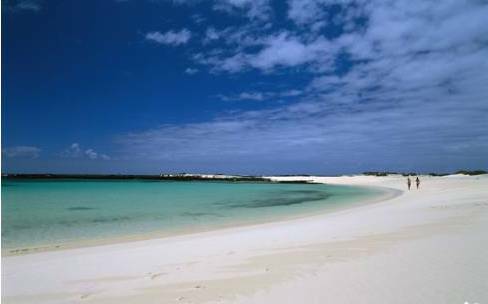 Gran Canaria is a little further to the west of Fuerteventura but also not far from the African coastline which puts it very close to the Sahara. For thousands of years Sahara sand has found its way on to the island via the frequent westerly winds creating the wonderful lush beaches and famously vast sand dunes that we see today. They are quite simply some of the finest examples of beaches you’ll find anywhere in the world. Of course, Gran Canaria has a lot more than beaches going on. But first, a word about the food. Canarian cuisine is essentially Spanish with a twist. There’s tapas and paella on tap of course, but you’ll also find for example the national dish, papas arrugadas, small Canarian potatoes boiled in salt and then baked and served covered in mojo salsa, a garlic sauce made from red and green peppers. For fish lovers, look for Caldo de Pescado (fish soup) and Vieja Sancochada. a casserole made from sea-bream. and Sardina de Norte, on Gran Canaria’s north coast, famous for its fresh sardines. And to round off a good meal make sure you try the traditional Bienmesabe which is basically almond and cinnamon custard on a sponge cake. Gran Canaria is known locally as the ‘miniature continent’ because of the variety of its changing climates and landscapes. At its centre there’s a mountainous region with peaks of over 6,400 feet creating an alpine climate on the higher slopes . 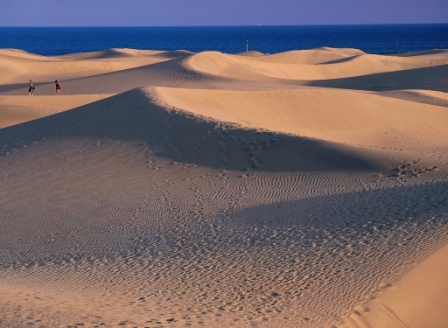 The north-west is much greener whilst the south is much more arid and desert like (the famous sand dunes of Maspalomas are here along with many of the tourist resorts and beaches). Mountains and cliffs hug the western coast whilst the east side is much flatter and warmer and where you’ll find the majority of tourist resorts which stretch all the way to the north to the capital city of Las Palmas where almost half the population live and where Christopher Columbus first stopped on his way back from the Americas. You can visit where he prayed, the Hermitage of San Antonio Abad. 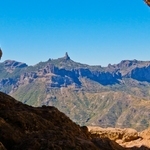 Gran Canaria’s also a rather special place as far as UNESCO is concerned because it’s put nearly a third of it under its protection as a biosphere reserve. So this ensures of course, that over 33 of Gran Canaria’s natural beauty spots including the Parque Rural del Nublo, the pine forest of Pinar de Tamadaba, the fabulous Las Dunas de Maspalomas (look out for the sand lizards) and Pino Santo are all safe from destruction or erosion at the hands of unscrupulous commercial developers. If you’re based in the south near Maspalomas you’ll be close to where all the fun stuff is. This is the place, where you’ll find water and theme parks, shopping malls and discos. Probably the best and biggest water park for a day out is Aqualand on the road to Palmitos Park. 130,000 square metres of slides and attractions for everyone and open every day from 10am to 5pm. Then again, if its more fauna and wildlife you’re after then the aforementioned Palmitos Park is the one to head for. It’s a sub tropical oasis with animals, hundreds of birds and over 15,000 plants and trees. Or how about the Holiday World leisure complex at Campo Internacional in Maspalomas. Just about everything is here from roller coasters and dodgems to a wellness centre, gym and nightclubs open well into the early hours. Almost 96 per cent of Canarians are Roman Catholics and they do love an opportunity to have a fiesta or two for a religious event and also for cultural reasons . Consequently there is always something happening on the island. One of the biggest is during Semana Santa (the Holy Week before Easter), when there are major carnivals taking place all over the island. Some other significant celebrations are the WOMAD (World of Music and Dance) and the Festival de Teatro y Danza de Las Palmas de Gran Canaria (Theatre and Dance Festival). It’ll be well worth checking with your local tourist information centre to find out if there is one happening near where you’re staying. Carnival is the major event each March, but you can be sure that there will always be a Fiesta for something going on, whatever time of the year. 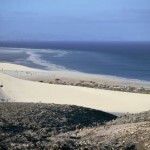 Fuertenventura. Small but deliciously formed.